Troubleshooting typical symptoms that arise during installation. The following test will determine if your MSD is producing a spark. If you are using the White wire (points or electronic amplifier) of the MSD to trigger the ignition, follow these steps. Remove the coil wire from the distributor cap and position the terminal so it is approximately 1/2" from a good ground. Disconnect the MSD White wire from the distributor points or the ignition amplifier. Turn the ignition to the On position. DO NOT CRANK THE ENGINE. Tap the White wire to ground several times. Each time the wire is pulled away from ground a spark should jump from the coil wire to ground. If spark is present, the ignition is working properly. Inspect all of the wiring. Substitute another coil and test again. If there is now spark, the coil is at fault. If there is still no spark, check to make sure there is 12 volts on the small Red wire from the MSD when the key is in the On position. If 12 volts are not present, find another 12 volt source and repeat the test. After inspecting the test procedures and inspecting all of the wiring, there is still no spark, the Ignition is at fault. See the Warranty and Service Page for Information. If you are using the 2-Pin Magnetic Pickup of the MSD to trigger the ignition, follow these steps. Disconnect the MSD Magnetic Pickup connector from the distributor. With a small jumper wire, short the Green and Violet magnetic pickup wires together then pull the jumper off. Each time the short is removed a spark should jump If spark is present, the ignition is working properly. Early Ford and GM: To solve the Run-On problem, a Diode is supplied with the MSD in the parts bag. By installing this Diode in-line of the wire that goes to the Charging indicator, the voltage is kept from entering the MSD. The diagram below shows the proper installation for early Ford and GM vehicles. If your fuel injected import vehicle fails to start or the tachometer reads erratically, you will need an MSD Tach Adapter PN 8910. If the PN 8910 is installed and you have spark but the vehicle will still not run, you will need a special Tach Adapter. Contact MSD Tech for the correct Adapter. In some instances, after installing an MSD Ignition control unit on an import vehicle may result in a no-start situation or a erratic tach. Depending on which MSD Ignition was installed on the vehicle a tach adapter will be required to remedy the situation. A no-start situation may result from a smart ECU not sensing coil current as a result not energizing the Fuel pump. The 8912 tach adapter will develop an artificial coil current to sadisfy the Smart ECU’s requirement to energize the Fuel pump again. An erratic tach or non working tach is a result of the factory wire being removed from the coil -. The adapter will also develop a tach signal to satisfy the tach again. If a DIS controller was installed, a PN 8912 will be required. Installation to an MSD DIS-4 Ignition using Four Channels. If a 6 series, 7 series, or SCI ignition was installed, a PN 8910-EIS will be required. The magnetic pickup in MSD Distributors can also be checked with an Ohm meter to make sure it is within operating specifications. Once again, connect the Ohm meter's leads to the two terminals of the pickup. The resistance should be within 500 - 700 ohms. If the resistance is out of this specification, inspect the condition of the wires leading to the pickup for abrasion, shorting or opens. If the wiring is okay, the pickup is at fault. NOTE: The Ignition will check good if the pickup is at fault. Follow the Checking for Spark procedure. An age old hot rodding adage goes something like: “An engine is more than the sum of its parts”. While that oft-repeated saying has been tossed around so much as to be threadbare, that doesn’t make it any less true. Details are key, and are what separate two otherwise identical engines. Many enthusiasts are so focused on choosing parts that they sometimes overlook little things in assembly that will improve their engine’s durability as well as its performance. One example is careful preparation of the oiling system. They may believe the factory knew what it was doing when it designed the engine, so they see no need to mess with it. What they fail to take into account is manufacturing tolerances and things like core shift during the casting process. They also may be overlooking the fact that they are asking far more of their engine than the manufacturer had intended it to provide. American Motors enthusiasts know that their marquee’s V8 engines have a unique oiling system that requires special consideration. These engines supply oil to the distributor gear last and via a circuitous path, which needs careful preparation to ensure adequate oil flow. There are several key areas to focus your attention, and we will highlight each of them in this story. This discussion applies to AMC’s from 1967 and on: 290, 304, 343, 360, 390, and 401 cubic inch varieties. Follow along as we outline the trouble spots in the AMC V8’s distributor lubrication scheme and show you how to counteract them. A little extra attention given to the oiling system with these simple modifications during your next build will pay big dividends down the road. When performing final engine assembly, the first critical point is the front camshaft bearing orientation. Placement of this bearing requires precise alignment of the bearings’ oil feed hole with the block’s oil gallery. This ensures maximum oil flow to the camshaft’s front journal groove. The groove must completely encircle the journal in order to ensure proper lubrication throughout the camshaft rotation. There is a single bore in the front camshaft bearing journal groove that exits on the front face of the journal. This in turn feeds a groove in the rear of the cam timing sprocket. Be sure that the cam bearing or bearing journal (or both) is grooved. This is absolutely critical to proper camshaft and timing gear lubrication. Looking at the back side of the cam timing sprocket, make sure this groove lines up with the hole in the front of the camshaft. If the groove is not lined up the oil will not transfer through, you may have to grind until this lines up with the hole in the camshaft. The oil moves down the groove to a chamfer at the center bore then to a passage adjacent to the keyway. This passage is typically quite rough and benefits greatly from some clean up with a small file to minimize oil flow restriction. On the front of the cam timing sprocket is another chamfer, along with six small grooves on the face of this surface. These grooves redirect a small amount of oil to the timing chain and the fuel pump eccentric. From the timing sprocket, the oil continues on through the passage in the fuel pump eccentric adjacent to the keyway, and then to the distributor drive gear. The distributor drive gear has four holes amongst the gear teeth where pressurized oil is fed to the distributor gear. When this gear is installed, it is critical that these holes are not obstructed by the camshaft snout. The camshaft to the end of the gear has an open area so oil can feed through these holes. The camshaft retaining bolt and washer serve a dual purpose. Their installed height is important as they constitute the camshaft thrust button. Additionally, the diameter of the washer is critical as it seals the end of the distributor drive gear; forcing lubricant through the distributor drive gear’s oiling holes. There are some aftermarket front covers in circulation that also contribute to distributor gear failure. Before final assembly of the engine, test fit the distributor, oil pump gear and cover. With the distributor completely seated without the gasket in the oil pump shaft, and the pump gear fully seated in its housing, check to see if the distributor flange is seated against the top of the cover or if a gap exists, as shown. The distributor should bottom out in the front cover with no gasket when the oil pump is installed, if distributor does not bottom on the cover there could be a timing cover problem or the oil pump shaft groove depth issue. It could be the radius on the bottom of the oil pump groove to large, in which you can clean this with a file to get the proper fit. When installing the timing cover during final assembly, do not overlook installation of the dowel pins in the block. These will insure proper cover alignment. After installing the cover to the engine, install and test fit the distributor. Note, when installing the distributor, it should slide easily into place. If not, there may be an alignment issue, one of the Timing cover manufactures had issues with alignment of this cover and depth of the oil pump and distributor, this would cause the distributor to bind as it was installed and cause gear failure. At this point of the engine assembly, you should verify the distributor gear will be sufficiently lubricated. This can be observed through the fuel pump mounting hole. Using an oil pump priming tool, look for oil streaming around the outside of the distributor drive gear. Additionally, you should rotate the crankshaft and be sure this oil stream continues for two revolutions of the crank. Note, the use of racing oil will help the gears break in. This type oil has zinc which the oil manufactures removed from standard automotive oils. The zinc will help the gears mate. Solid Core Wires: You cannot run Solid Core Spark Plug Wires with an MSD Ignition Control. Solid Core wires do not suppress any Electro Magnetic Interference (EMI) which will interfere with electronics or rev limiters on your vehicle. A suppression style or spiral wound spark plug wire MUST be used. Make sure you are not using Solid Core wires. Inspect the routing of the Magnetic Pickup Harness. It should be routed clear of the coil primary wires and plug wires. It is best to route it along a ground plain such as the firewall, frame or engine block to form a shield around it, or replace the Black magnetic pickup cable with a shielded Gray cable PN 8862, which has a ground wire on one end. Check the polarity of the magnetic pickup wires of the distributor. Reverse the connectors and check the timing again. For Analog ignitions the correct polarity is whichever orientation gives the most retarded timing. For Digital Ignitions the correct polarity is whichever orientation give the most advanced timing. On Chevrolet engines, if the timing is retarding inspect for cam-walk. This is especially prevalent on engines with a chrome or stock type replacement timing chain cover that is actually bowing forward allowing the cam to "walk", due to thin stamping. To check this, wedge something in-between the water pump and timing chain cover to keep the camp from walking. If this corrects the timing fluctuation, replace the timing chain cover. Worn distributor gear, inspect the distributor gear for excess wear or incorrect gear mesh if the gear is riding too high or too low on the cam gear. If correct the wear pattern should show the gear mesh in the center of the gear. On the chart above, the trigger wire on tachometers that are marked None may be connedted to the Tach Output Terminal on the MSD 6 Series Ignition Unit using the supplied Female Faston Receptacle. The diagram above shows a typical wiring schematic for aftermarket tachometers. These tachometers will usually have three wires and sometimes a fourth for a panel light. Note #1: There are basically two types of tachometers: Current Triggered Tachometers and Voltage Triggered Tachometers. 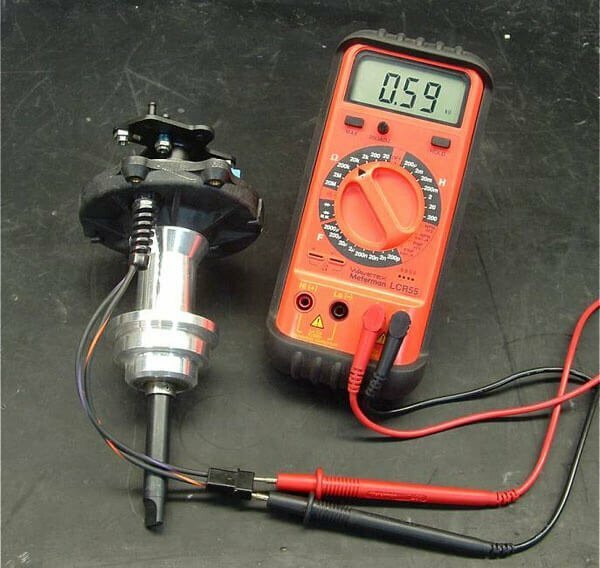 These type of tachometer that is on the vehicle may be recognized by the way it is connected to the ignition coil. The drawings below show two wiring diagrams to help in determining which type of tachometer is on the vehicle. Note #2:These auto manufacturers use tachometers made by different tachometer manufacturers. Some will work when connected to the MSD 6 Series Ignition Unit Tach Output Terminal. Otherse may require an MSD Tach Adapter. Connect the tachometer trigger wire to the Tach Output Terminal as shown below to determine if the tachometer is operating correctly. If it does not operate correctly, go back to the Chart to determine which MSD Tach Adapter should be used. Note #3:General Motors Corporation vehicles have an inline filter that should be bypassed when the factory tachometer drops back to zero as the engine RPM is going up. The drawings at the right show what the filter might look like. Located the filter by tracing the wire from the Tach Terminal on Vehicles equipped with an HEI Ignition system. On vehicles equipped without an HEI, trace the wire from the coil negative terminal until the filter is found. Disconnect both wires from the filter and leave disconnected. Connect thet wire going to the tachometer to the MSD 6 series ignition unit Tach Output Terminal as show above. Note #4:If the Tachometer is connected to the positive side of the ignition coil, do not attempt to connect this tachometer to the tach ouput terminal on the MSD 6 series unit. See Note #1 for a diagram of a current triggered tach. The tachometer is connected to the positive side of the ignition coil. The ballast resistor or resistance wire can be on either side of the coil.